It’s official: we are in the dog days of summer. What better time to explore some fun new products for your dog? Here are a few of our personal favorite dog products, from dog toys to grooming products, as well as our most trusted brands. Be sure to read to the bottom for some great tips on how to help your pup beat the heat, too. Then, jump in on the comments and let us know what finds you love for your own four-legged friend! Lupine Pet. A great option for a new puppy or energetic older dog; if your pup scratches or chews through a leash or a collar, they will replace it at no cost! Belted Cow. This brand is typically for humans, but they have a great line of stylish matching collar and leash options. Blueberry Pet. Blueberry collars and leashes are a great budget buy, and they come in so many colors, patterns, and styles. If you are finding that your dog is less than obedient on walks, there are several other types of collars and harnesses that may help train your dog to walk with fewer distractions. Martingale collar: Martingale collars slide closed when your dog applies pressure, like when he tries to run after a rabbit. This is a nice alternative to a metal prong/choke collar that will still give your dog a physical cue that it needs to heel back to you. If It Barks offers a great martingale option that has strong nylon and a nickel-plated steel d-ring to attach a leash. They offer options that have a clip to put the collar on, or ones that simply slip over your dog’s head. Harness: There are several types of harnesses that may work for your dog. One of our favorites is the PetSafe Gentle Leader Head Collar. Once you train your dog with this head collar, they will become much calmer even when putting it on before your walk. A great option for smaller dogs is the Puppia Dog Harness. Depending on how you decide to train your dog, crates and playpens are a great option. MidWest Life Stages crates can grow with your dog, so if you have a larger breed, purchase this type of crate that has a moveable divider. Consider getting an accompanying crate liner bed. Puppies with anxiety might also respond well to a warm plush toy in their crate: this one comes with a heating pack and an electronic heart that produces a realistic heartbeat. For families on the move, there are also excellent options for foldable soft dog crates. This travel crate works great for small to medium breeds, and check out this travel crate for larger dogs. If you are looking to portion off a non-fenced yard, or even want to contain your dog in a small space inside your home, these adjustable playpens also from MidWest function as either a playpen or a fence. They can also be anchored into the ground. Clicker training is a cost-effective method that can be used not only for dogs, but also to train cats, birds, and other types of animals. Positive reinforcement is another popular training method that really only takes consistency in commands and delicious treats. There are many resources for training dogs with this method, like the book Training the Best Dog Ever and various YouTube channels. Particularly if you have a young dog, it’s always nice to have pee pads on hand (we love the Pogi’s Pet Supplies brand because their products are earth-friendly). While we’re on this topic, Nature’s Miracle has an excellent urine removal product that eliminates odor, stain, and residue, and Pogi’s also sells great scented or unscented pet waste bags. Pet Neat self-cleaning slicker brush. Works great for our non-shedder, but is especially convenient for breeds that shed more – just push the button to release the bristles into the brush and wipe your hand over the smooth plastic to remove fur from the brush. Hertzko undercoat dematting comb. This is a GREAT tool to remove tangles, knots, and mats. The grip is comfortable, and the teeth are very long to help you detangle with ease. One important thing to watch for: one edge of the teeth is razor sharp, so when you are sweeping hair fluffs off of this tool, don’t accidentally cut yourself! Cloud Star dog shampoo and conditioner. We love this “buddy wash” — it smells great for days, washes out easily, and only takes one step! You can also buy this product in a bulk size. Zwipes microfiber towels. After the bath and initial water shake-outs, we love these microfiber towels. They dry much more tthoroughlythan traditional towels, so much so that we have stopped blow drying post-bath. Burt’s Bees waterless shampoo. Burt’s Bees has many great dog products, but their waterless shampoo is one of our favorites for between baths. Nature’s Miracle deodorizing bath wipes. We stick to waterless shampoo for between baths, but we love using bath wipes for cleaning muddy paws after walks. Hyper Pet flippy flopper. This frisbee is light, flies well, and is difficult to chew up. Chuckit! Launcher. There are two benefits to the launcher – first, it allows you to throw a ball much further, and second, you don’t need to touch a slobbery ball! It does come with a ball, but standard tennis balls work with the classic size. Nylabone dura chew bones. We love how durable Nylabones are, and our dog likes all of the different flavors they have. Ethical Pets stuffingless dog toys. These toys have all the fun of a plush toy without the worry of your dog tearing open a toy and eating the fluff out of the inside. Gnawsome squeaker dog balls. These durable squeaker balls have a nice medium squeaking sound that your dog will love (and that you won’t completely annoyed by!). What you feed your dog is a very dog-specific preference, and you should consult your vet if you see your dog scratching their face or excessively licking their paws, as these are both signs of food allergies. Aside from food, there are several products related to mealtimes that we love! AmazonBasics stainless steel dog bowls. We love the simplicity of these stainless bowls – just remember to wash them frequently to keep your pup happy and healthy! Hoki Found silicone food mat. If your pet is a messy eater, you may want to invest in a non-slip mat for under your food bowls. Slow feeder bowl. For dogs that eat too fast, there are a variety of products that make eating a game to slow them down. Vittles Vault gamma travel-tainer. We love this container that stores dry dog food with an airtight seal. The blue bowls that cap the top and bottom of the food holder then become a food and water dish. These collapsible silicone dog bowls are also great and fold down to flat discs. Gulpy water dispenser. The gulpy is a great thing to bring along even on a short walk during these hot summer days – squeeze the water into the colored receptacle and let your dog gulp it right out! The gulpy also has a nice loop to attach to a leash or your belt. Get some frozen toys: Pick up a toy or two that is meant to be frozen. Some even have treat holders for added incentive. Whip up some frozen dog treats: Blend ½ of a small banana and a handful of blueberries with some ice cubes and fill a small ice cube mold. Pop them out after 2 hours minimum. There are also frozen treat makers you can purchase specifically for dogs. Kongs can be filled with blueberries, peanut butter, bananas, or other freezable treats. Again, this is all dependent on your dog’s food sensitivities and preferences. Create a frozen treasure hunt for your dog: Throw a few of your dog’s favorite toys into a durable bowl and fill partway with water, freeze for a few hours, and pop out to create a fun outdoor treasure hunt for your dog. Sprinklers are fun for the whole family — dogs included! There are some fancy pet-activated sprinklers on the market, but truth be told, dogs love running through sprinklers with the kids in the backyard! 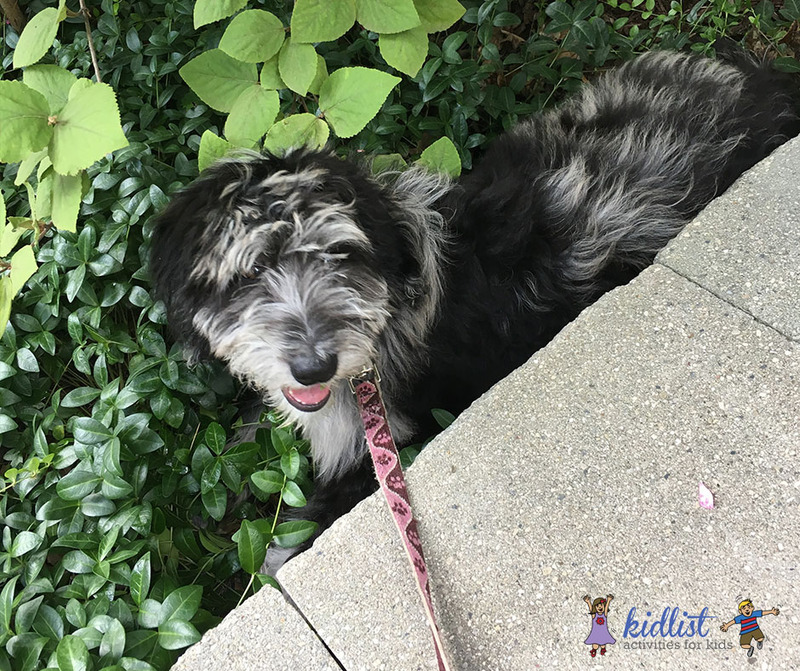 Our new furry friends guide is an amazing resource for local dog owners, sponsored by Robert Hutchison, your Realtor for the western suburbs of Chicago. If you are looking to buy or sell a home in the western suburbs, give him a call!! Be the first to comment on "Our 2018 Favorites: Dog Toys, Leashes, Grooming Products, and More"